Edit PDF files without requiring an Internet connection! Movavi PDF Editor lets you change text and graphics directly in your PDF documents. There are many times when you might need to edit a PDF document – for instance, if you have to amend a business contract, update a resume, or insert an illustration into a report. Movavi PDF Editor is a powerful, easy-to-use app for editing PDF files of any size. 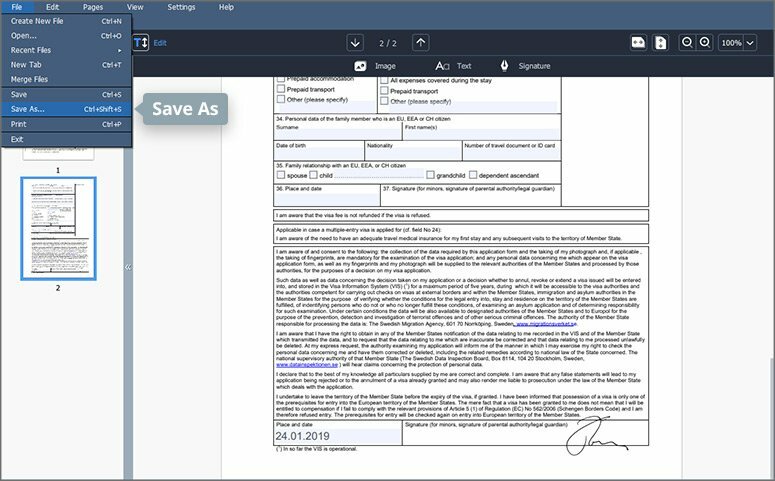 You can use the program to add or edit text in a PDF, apply different text styles, and insert shapes, images, and other objects into a PDF document. 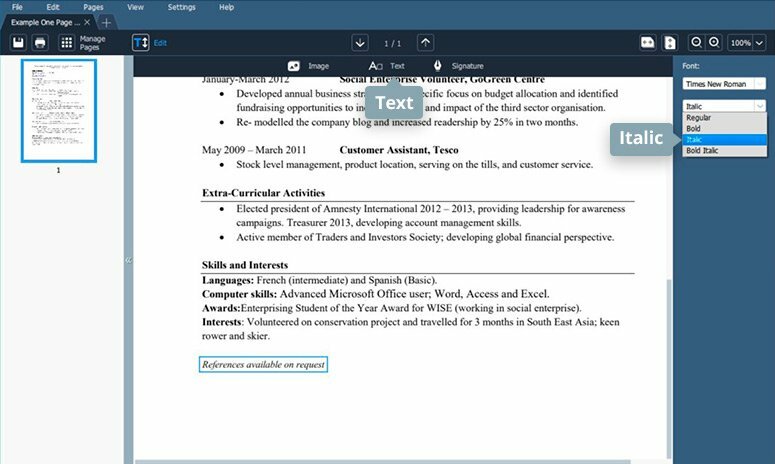 Keep reading to discover how to open and edit a PDF using Movavi’s PDF-editing software. 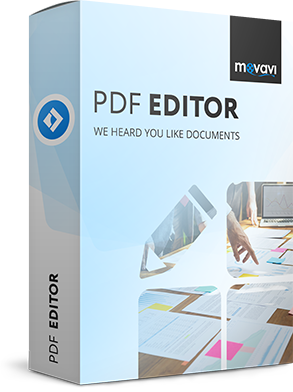 Download the latest version of Movavi PDF Editor from this page. Once the distribution file is downloaded, double-click it and follow the instructions on your screen. Launch the program, click Open File at the top of the program window, and select the PDF file that you wish to edit. Switch to the Edit mode in the PDF Editor by clicking on the Edit button in the toolbar. From the drop-down menu, choose the Text option. 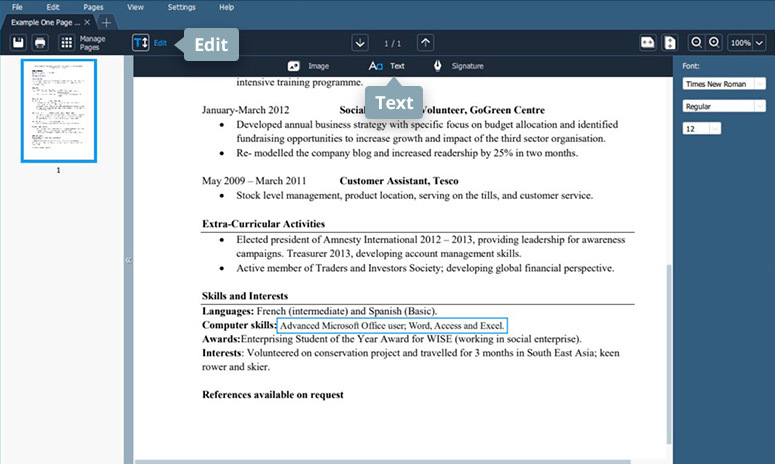 The program automatically highlights editable text lines so that they are easy to locate in the document. Select the text block that you want to update by clicking on it and make the required changes to the text. To save the modified document with a new name, drop the File menu and choose Save As. To save the edits back into the source file, use the Save command from the File menu. Click the Download for Free button. The installer will be automatically saved in your Downloads folder. Once the file has downloaded, run the installer and follow the on-screen instructions. Open the program and click the Open File button to add the file you want to modify. 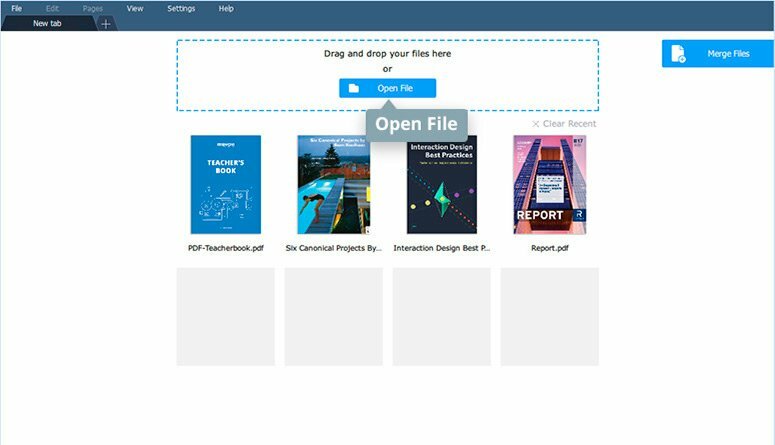 You can also add files using the drag-and-drop feature. Go to the Edit mode and hit the Text button. Select the text you want to format. In the right-hand panel, choose the font, point size, or style that you want to apply. To save your changes to the document, use the Save As or Save command on the File menu. The Portable Document Format (PDF) is a file format invented by Adobe Systems in the 1990s. PDF files pick up formatting information from different types of desktop publishing software, allowing users to send formatted documents and have them reproduced on the recipient's monitor as they were intended, even when the recipient does not have access to the application used to create the original documents. The PDF is intended to preserve the layout, format, and image quality of the original document. Download the program installation file, then run it and follow the installation instructions. 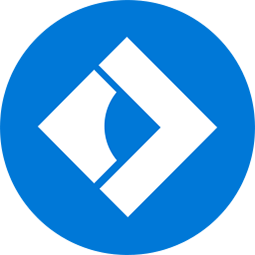 Launch the application and open a PDF document using drag-and-drop or the Open File button at the top of the window. To edit images within your document, proceed to the Edit mode. The program will automatically highlight editable objects when you hover over them. Just select the desired image and start working with it. To resize the image in the document, drag any of the frame handles around the border. To remove or rotate the image, right-click to open the context menu. To save the PDF as a separate file, choose Save As from the File menu and type a new name for the modified file. If you don’t need to save a copy, you can apply the changes to the current file using the Save option. How do you edit a PDF file? Forget insecure, unreliable online PDF services – our secure Movavi PDF Editor is always at your service!